This article is the third in a series that deals with coral reef aquarium chemistry issues on a basic and practical level. Its primary purpose is to get new aquarists to focus on those aspects of reef aquarium chemistry that are truly important, instead of on those that are not. New aquarists are bombarded with a huge assortment of issues and opinions related to aquarium husbandry practices, and none seems to cause more anxiety than chemistry issues. Some of these issues are actually very complicated, and the answers to many questions are simply not known. Fortunately for hobbyists, knowing the answers to these questions is rarely important to keeping a wonderful reef aquarium. Those issues that are important to understand are much more straightforward and can be solved without excessive anxiety. The first article in this series focused on issues related to the saltwater used in a coral reef aquarium, including selecting salt mixes, measuring salinity and purifying tap water. The second article focused on which additives are necessary and useful, and which may not be. This third article deals with issues related to aquarium pH. Unlike many other areas of coral reef aquarium husbandry, and even other chemistry related issues, pH is one whose answers are often especially clear cut. Aquarists can and do readily debate which foods, lights, water flow regimes, temperatures, filtration, etc., are most appropriate for a coral reef aquarium. Even pH can be debated to some extent, with questions such as, “What pH is best?” Many questions relating to pH, however, leave little room for scientific debate. It is well understood, for example, what effect most chemicals have on seawater's pH, how carbon dioxide in the air impacts aquarium pH, how aeration impacts aquaria's daily pH swing, what buffers do and how, etc. Consequently, the ways of dealing with various sorts of pH problems are very well understood on a scientific basis. It also turns out that the answers may surprise many beginning aquarists. For example, water changes almost never solve low pH problems, even 100% water changes. Unfortunately for many aquarists, pH is not something that they have much experience with aside from their aquarium and perhaps a swimming pool. To many it is almost a black box measurement: something to be controlled, but whose physical meaning makes little sense to them. This article will describe pH in a more intuitive way (as opposed to a more mathematical way, as in previous articles). While plenty of chemical mathematics is used to determine some of the interrelationships between various water parameters (such as atmospheric carbon dioxide, alkalinity and pH), this article assumes that most beginning aquarists are better off focusing on the answers, rather than how they are found. This article focuses on what pH ranges are appropriate in coral reef aquaria, what factors tend to drive pH away from normal, what happens to a coral reef aquarium if its pH deviates from natural levels, and how to best control an aquarium's pH. What is the Acceptable pH Range for Reef Aquaria? Why Does pH Become Elevated? Aquarists spend a considerable amount of time and effort worrying about, and attempting to solve, apparent problems with the pH of their aquaria. Some of this effort is certainly justified, as true pH problems can lead to poor animal health. In many cases, however, the only problem is with the pH measurement or its interpretation. Several factors make monitoring a marine aquarium's pH level important. One is that aquatic organisms thrive only in a particular pH range, which varies from organism to organism. It is, therefore, difficult to justify a claim that a particular pH range is "optimal" in an aquarium housing many species. Even natural seawater's pH (typically 8.0 to 8.3) may be suboptimal for some of its creatures, but it was recognized more than 80 years ago that pH levels different from those of natural seawater can be stressful to fish. Additional information is now available about optimal pH ranges for many organisms, but the data are inadequate to allow aquarists to optimize pH for most organisms which interest them. Changes in pH do substantially impact some fundamental processes taking place in many marine organisms. One of the most important of these processes is calcification, or the deposition of calcium carbonate skeletons. Calcification by many organisms is known to depend on pH, dropping as pH falls below normal levels. If the pH is low enough, coral skeletons actually dissolve. Using this type of information, along with the integrated experience of many hobbyists, we can develop some guidelines about what is an acceptable pH range for reef aquaria, and what values push the limits. These recommended ranges are detailed in subsequent sections. 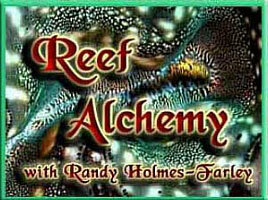 In previous articles I have discussed in detail what pH means in the context of a coral reef aquarium. In short, all that many aquarists need to know is that pH is a measure of hydrogen ions’ (H+) concentration in solution, and that its scale is logarithmic. Regardless of the pH, some H+ ions are always present, and the lower the pH, the more there are. A difference of 0.3 pH units between any two pH values implies about a twofold difference in the H+ concentration. A difference of one pH unit between any two pH values means a difference by a factor of 10 in the H+ concentration. At pH 8 there are 10 times fewer H+ ions than at pH 7. At pH 9 there are 100 times fewer H+ ions than at pH 7. Consequently, a small change in pH indicates a big change in the concentration of H+ in the water. Figure 1 may help some aquarists understand the relationship between pH and the concentration of H+ more readily than do numerical comparisons. It shows a color representation of the concentration of H+ as a function of pH, with the intensity of the green directly representing the concentration. The darker the green, the more H+ in solution. Figure 1. The relationship between pH and the concentration of H+ ions. The intensity of the green color is directly related to the H+ concentration. Another interesting and important fact is that the pH resulting from equal volumes of two solutions being mixed together is not just an average of the two solutions’ pH values (which the measurement scale's logarithmic nature alone implies), but is also determined by each of the solutions' buffering power and, to a lesser extent, by more esoteric factors. Sometimes the pH that results when two solutions are combined is not even between the two starting values. Consequently, evaluating pH problems and potential solutions requires some knowledge of more than just the pH of the solutions involved. This fact is important for reef aquarists when considering, for example, whether the pH of pure freshwater impacts the pH of seawater when added to it. In this case, the pure water's effect is almost negligible, regardless of its measured pH value. That the alkalinity is at least 2.5 meq/L (7 dKH) and preferably higher at the lower end of this pH range. This statement is based partly on the fact that many reef aquaria operate acceptably in the pH 7.8 to 8.0 range, but many of the best examples of these types of aquaria incorporate calcium carbonate/carbon dioxide reactors which, while tending to lower the pH, also tend to keep the carbonate alkalinity fairly high (at or above 3 meq/L.). In this case, any problems associated with calcification at these lower pH values may be offset by the higher alkalinity. Low pH stresses calcifying organisms primarily by making it harder for them to obtain sufficient carbonate to deposit skeletons. Raising the alkalinity may mitigate this difficulty by supplying extra bicarbonate to them. That the calcium level is at least 400 ppm. Calcification becomes more difficult as the pH falls, and it also becomes more difficult as the calcium level falls. It would not be desirable to push all of the extremes of pH, alkalinity and calcium at the same time. So if the pH is on the low side and cannot be easily changed (such as in an aquarium with a CaCO3/CO2 reactor), at least make sure that the calcium level is acceptable (~400-450 ppm). Likewise, one of the problems at higher pH (above, say, 8.2, but becoming progressively more problematic with each incremental rise) is the abiotic precipitation of calcium carbonate, resulting in a drop in calcium and alkalinity, and the resultant clogging of heaters and pump impellers. If the aquarium's pH is 8.4 or higher (as often happens in an aquarium using limewater), then it is especially important that both the calcium and alkalinity levels be suitably maintained (that is, neither too low, inhibiting biological calcification, nor too high, causing excessive abiotic precipitation on equipment). After having helped with the pH problems of more than a thousand aquarists, it is apparent to me that pH measurement is a problem almost as often as is a real deviation from normal pH ranges. So whenever pH seems to be outside optimal ranges, it is important to first verify that the pH measurement is accurate. The measurement of pH can be made in a variety of ways. Most common for aquarists are pH test kits and electronic pH electrode/meter combinations. Test kits contain one or more dyes that change color as a function of the pH, so they may be blue at one pH, purple at a slightly higher pH and red at a still higher pH. Users just add the dye mixture to a test water sample and match the color to a reference chart to determine the pH. Such test kits are usually specific for a small pH range of interest, so a pH test kit for use in freshwater systems at pH 5-7 may not be useful in seawater at pH 8.2. Several drawbacks to pH test kits make them less desirable than pH meters. Such kits may be hard to read precisely enough if their color change is slight over the pH range of interest. This concern may be particularly relevant to aquarists with certain types of color blindness. A generally larger concern with pH test kits, however, is that it is usually not easy to determine whether they are accurate. Even if they are made correctly, the organic dyes they contain degrade over time, and some kits are known to vary in accuracy when their dyes are old. If you choose a pH test kit, I recommend a high quality brand that you trust, and to not rely on it when it gets old. How old is too old is hard to judge, because aquarists may not know when their kit was actually made, and different brands use different dyes and can be packaged in ways that make them more or less susceptible to degradation over time. I would not rely on a pH test kit that was known to be more than two years old. If I were using a pH kit, and got a result that seemed unusual (especially high or low, for example), I would try to verify it with a different brand of kit or a pH meter before taking any action to solve a problem that may just be a testing error. Electronic pH meters usually use a glass electrode to directly sense the concentration of H+ in the solution. In previous articles I have detailed how they work, but having such information is not always necessary. An important aspect of electronic pH meters is that they must always be calibrated before use. That does not mean that they must be calibrated with every use. Depending on the required accuracy and other aspects of how they are used, useful calibration may last from a few hours to a few months. Nevertheless, the calibration is important both to get an accurate reading, and as an assurance that the meter is actually working. Such assurances are not readily obtained with test kits, and that is a primary reason that I strongly prefer pH meters to pH kits, even if the pH meters are fairly inexpensive. Many of the attributes that make for good pH meter selection have been discussed in previous articles. One issue that pH meter users may not recognize as important is the selection of the pH calibration buffer brand. Some brands sold to aquarists are apparently unsuitable, because they do not actually have the pH that they claim. Good choices for pH calibration buffers include those provided by American Marine (Pinpoint), Milwaukee, Hanna and Thermo (Orion). Few home-made solutions are suitable for calibrating or checking the accuracy of pH meters (and none that I know of for most marine pH test kits), but a borax solution can be made that will have a pH of approximately 9.2. That value can be used to check the accuracy of any pH meter, and may be useful in calibrating some meters (although a pH 7 solution will generally also be necessary for calibration). Marine aquarium water's pH is intimately tied to the amount of carbon dioxide dissolved in the water and to its alkalinity. The reason that carbon dioxide impacts pH is because when it enters the water, it rapidly turns into carbonic acid. Acids lower pH, so more carbon dioxide means more carbonic acid, which means lower pH. If seawater is fully aerated with normal air (that is, it is in full equilibrium with the air), then its pH is exactly determined by its carbonate alkalinity: the higher the alkalinity, the higher the pH. There is, in fact, a simple mathematical relationship between alkalinity, pH and carbon dioxide that I have discussed previously. 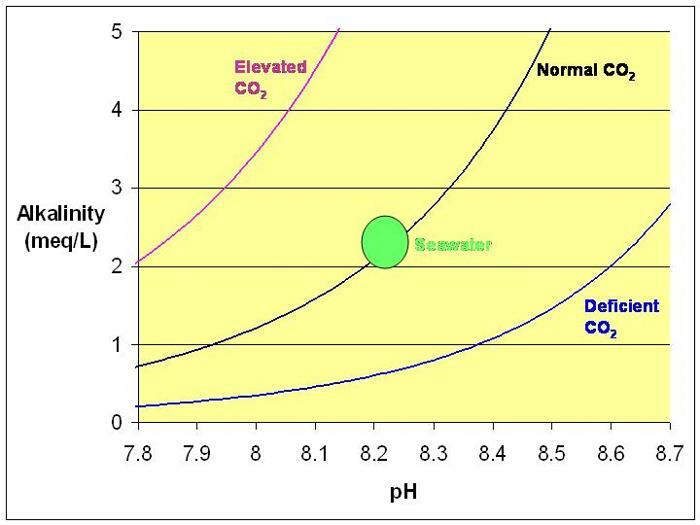 Figure 2 shows this relationship graphically for seawater equilibrated with normal air (350 ppm carbon dioxide), and equilibrated with air having extra carbon dioxide, as might be present in certain homes (1000 ppm) or when the carbon dioxide is deficient (as may happen in aquaria using limewater, also known as kalkwasser). Understanding the overall relationship between carbon dioxide, alkalinity and pH (Figure 2) is a key principle in solving most pH problems encountered in coral reef aquaria. Figure 2. The relationship between alkalinity and pH in seawater with normal carbon dioxide levels (black), excess carbon dioxide (purple) and deficient carbon dioxide (blue). The green area represents normal seawater. One of the first things that aquarists who measure pH notice is that the pH changes from day to night in coral reef aquaria. This diurnal (daily) change in pH in reef aquaria occurs because of the biological processes of photosynthesis and respiration. Photosynthesis is the process whereby organisms convert carbon dioxide and water into carbohydrate and oxygen. So there is a net consumption of carbon dioxide during the day. This causes many aquaria to become deficient in CO2 during the day, raising their pH. Likewise, all organisms also carry out the process of respiration, which converts carbohydrates back into energy. In the net sense, it is the opposite of photosynthesis, producing carbon dioxide and reducing pH. This process is happening continuously in reef aquaria, but is most evident at night when photosynthesis is not pushing pH upward. The net effect of these processes is that pH rises during the day and drops at night in most reef aquaria. This change varies from less than a tenth of a pH unit, to more than 0.5 pH units in typical aquaria. Complete aeration of the aquarium’s water will entirely prevent this diurnal pH swing, by driving out any excess carbon dioxide or absorbing carbon dioxide when deficient. In practice, equilibration of carbon dioxide by aeration is difficult, and this goal is not often attained. Consequently, the pH does change between day and night. Higher alkalinity implies more bicarbonate and carbonate in the water, and together these serve to buffer the water against pH changes (that is, they resist the change in pH as additional acids or bases are added). So the higher the alkalinity, the lower the diurnal pH swing. Also, the higher the pH, the more effective is the buffering provided by bicarbonate and carbonate in seawater (up to about pH 9), so the higher the average pH, the smaller the diurnal swing. Additional chemicals in the water also help to reduce the pH swing; borate, for example, buffers against pH changes. With that all said, however, I do not believe that the actual change in pH each day is particularly important. I won’t go into the reasoning behind this claim here, other than stating that it is my opinion, based on my understanding of how most organisms control their internal pH, but I do not believe that diurnal pH changes that stay within the range of pH 7.8 to 8.5 are particularly stressful to most reef organisms. That is, these changes are no more stressful than being at the same pH all day. A constant pH of 7.9 may be worse for many organisms than a pH that varies from 8.0 to 8.5 each day. Of course, if the diurnal swing takes the pH outside of this range, i.e., below 7.8 or above 8.5, then certain processes take place that should be corrected, as detailed below. Under normal circumstances an aquarium's pH is nearly always highest at the end of the light cycle. The only time that this is not the case is when there are timed additions of other things that impact pH (e.g., limewater, other alkalinity additions and even the entry of carbon dioxide from the room's air, in which the carbon dioxide level may vary as human activities around the aquarium change throughout the day). The diurnal pH swing alone is not typically strong enough to drive reef aquaria's pH to excessive levels (i.e., > 8.5). If it does, the aeration is clearly inadequate, so more aeration likely will solve the problem. The most common way for reef aquaria to reach excessively high pH is through high-pH additives, most notably the use of alkalinity additives that contain hydroxide (limewater, also known as kalkwasser) or carbonate (some two-part calcium and alkalinity additives, for example). In a previous article I showed that adding sufficient hydroxide to increase the alkalinity by 0.5 meq/L (a 10 ppm calcium rise, if using limewater) immediately boosted pH from pH 8.10 to 8.76. After the system had a chance to recover by pulling in more carbon dioxide from the air, its pH subsided to 8.33. Likewise, I showed that adding sufficient carbonate to increase alkalinity by the same amount resulted in an immediate pH increase from 8.10 to 8.44. This rise is smaller than with limewater, but is still potentially enough to merit caution. Some solutions to pH problems are peculiar to a specific cause, such as adding vinegar directly to limewater, or using less limewater than normal. Some general solutions, however, are frequently effective. Water changes are generally not an effective long-term solution to any pH problems. My recommendations on how to deal with high pH problems are detailed below. Adding a buffer is a very poor way to control high pH. The best option in this regard is to add straight baking soda, but it lowers pH only slightly and provides a large boost to alkalinity. I showed experimentally in a previous article that adding enough baking soda to lower artificial seawater's pH by 0.04 pH units raises alkalinity by 0.5 meq/L (1.4 dKH). The most benign way to reduce high pH is to aerate the water more. Whether the aquarium looks well-aerated or not, and regardless of its oxygen level, if its pH is above 8.5 and its alkalinity is below 4 meq/L, then the aquarium is not fully equilibrated with carbon dioxide in the air (if its alkalinity is much higher than 4 meq/L (11 dKH), then that may also require correction). Equilibrating carbon dioxide can be much more difficult than equilibrating oxygen. Air contains very little carbon dioxide (about 350 ppm) relative to oxygen (210,000 ppm). Consequently, a lot more air needs to be driven through the water to introduce the same amount of carbon dioxide as oxygen. Perfect aeration will solve nearly any high pH problem, and will rarely cause any problem of its own. A. Direct addition of carbon dioxide: Bottled soda water (seltzer) can be used to instantly reduce an aquarium's pH. Be sure to select unflavored soda water, and check its ingredients to be sure it doesn't contain anything that should be avoided (phosphate, etc.). Many manufacturers list water and carbon dioxide as the only ingredients. I recommend adding 6 mL of soda water per gallon of tank water to reduce pH by about 0.3 units. Add it to a high flow area away from organisms (such as in a sump). The local pH where it first is added will be very low. Going about this procedure slowly is better than proceeding too fast. If you do not have a sump, add it especially slowly. Some soda water may have more or less carbon dioxide in it than others, and the lower the aquarium's alkalinity, the more the pH will drop. Also, the higher the pH, the less the pH will drop, because seawater's buffering capability declines steadily as the pH drops from about 9 to 7.5. Figure 3. 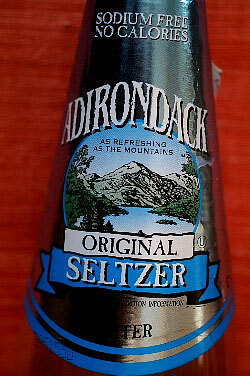 Adirondack Seltzer, used to add carbon dioxide and lower pH. B. Direct addition of vinegar: Commercial distilled white vinegar (typically 5% acetic acid or "5% acidity") can be used to instantly reduce an aquarium's pH. Do not use wine vinegars because they may contain undesirable organics in addition to the acetic acid. I recommend adding 1 mL of distilled white vinegar per gallon of tank water to initially reduce pH by about 0.3 units. Once again, add it to a high flow area away from organisms (such as in a sump). The local pH where it first is added will be very low. Going about this procedure slowly is better than proceeding too fast. If you do not have a sump, add it especially slowly. The lower the aquarium's alkalinity, the more the pH will drop. Also, the higher the pH, the less the pH will drop, because seawater's buffering capability declines steadily as the pH drops from about 9 to 7.5. Remember, there may be an additional later drop in pH as the aquarium's organisms metabolize the vinegar to carbon dioxide. Figure 4. 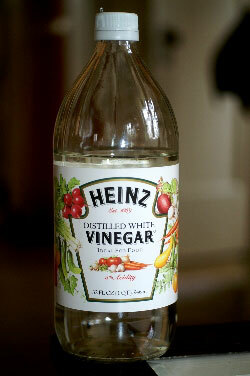 Heinz Distilled White Vinegar, used to lower pH. C. Addition of vinegar via limewater: Commercial distilled white vinegar can be used to reduce a tank's pH by adding it to limewater that is subsequently added to the aquarium (instead of using limewater alone). Do not use wine vinegars because they may contain undesirable organics in addition to the acetic acid. A reasonable dose to start with is 45 ml of vinegar per gallon of limewater. As mentioned above, low pH becomes a problem when it falls below about 7.8; that is, when the pH drops below 7.8 for any portion of the day. Of course, if the pH reaches a low value of pH 7.9, aquarists may still want to raise it, but the need is not so immediate. Several things commonly reduce pH, and each has its own unique solution. Finally, there's nothing to prevent a tank from having all of these problems simultaneously! A calcium carbonate/carbon dioxide reactor (CaCO3/CO2 reactor) is in use on the aquarium. The aquarium has low alkalinity (substantially below 2.5 meq/L, or 11 dKH). The aquarium contains more CO2 than the surrounding air due to inadequate aeration. Don't be fooled into thinking that an aquarium must have adequate aeration because its water is very turbulent. Equilibrating carbon dioxide is MUCH harder than simply providing adequate oxygen. There would be NO diurnal pH swing if carbon dioxide were perfectly equilibrated. Because most aquaria's pH is lower during the night than during the day, they are demonstrating incomplete aeration. The aquarium contains excess CO2 because the air that it is being equilibrated with contains excess CO2. This is the most common cause in cases that I have discussed that involve more than a thousand aquarists mentioning pH problems. The aquarium is still cycling and excess acid is being produced by the nitrogen cycle and the degradation of organics to CO2. Some of the possible causes of low pH listed above require an effort to diagnose. Problems 3 and 4 are quite common, and here is a way to distinguish them. Remove a cup of tank water and measure its pH. Then aerate it for an hour with an airstone using outside air. Its pH should rise if it is unusually low for the measured alkalinity (Figure 2). Then repeat the same experiment on a new cup of water using inside air. If its pH also rises, then the aquarium’s pH will rise simply with more aeration because it is only the aquarium that contains excess carbon dioxide. If the pH does not rise in the cup (or rises very little), then the inside air likely contains excess CO2, and more aeration with that same air will not solve the low pH problem (although aeration with fresher air should). Be careful implementing this test if the outside aeration test results in a large temperature change (more than 5°C or 10°F), because such changes alone impact pH measurements. Some solutions to low pH problems are peculiar to each cause, and these are detailed below. Some general solutions, however, are frequently effective. Water changes are generally not an effective long-term solution to any pH problems. Effective solutions for low pH problems include regularly using high pH additives and providing more aeration with fresh air. Limewater (kalkwasser) is the best choice as an additive for raising pH, followed by high pH two-part calcium and alkalinity additives. These methods have the advantage of raising pH without undesirably raising alkalinity relative to calcium. Do not worry too much about calcium or alkalinity rising from the addition of limewater to solve low pH problems. The demand for calcium and alkalinity rises in a reef aquarium as pH rises, so the net effect may be little change in calcium and alkalinity. Most often, the pH rises and no other problems are encountered. In any case, try these methods first and worry about such rises only if they happen and if they seem excessive. Buffers alone are not generally a good method for raising pH because they raise pH relatively little, and often result in excessive alkalinity. Unfortunately, the labels on many commercial buffers are written in ways that convince aquarists that their pH will be fine if they just add some buffer. More often than not, the pH is not improved for more than a day, and the alkalinity rises above desired limits. Two other generally useful methods of increasing pH include growing macroalgae that absorb some CO2 from the water as they grow (often in a sump that's lit on a reverse light cycle to the main tank to provide the maximum pH increase when the main tank is at its minimum pH), and aerating the water with fresh air. A common cause of low pH in a reef aquarium is the use of a calcium carbonate/carbon dioxide reactor. These reactors use acidic carbon dioxide to dissolve calcium carbonate and their effect is to deliver a substantial, but transient, amount of acid to the tank. Ideally, the carbon dioxide is blown back out of the tank after it has been used to dissolve the CaCO3. In reality, however, this process does not go to completion, and aquaria using CaCO3/CO2 reactors typically run at the low end of the pH spectrum. The solutions that follow assume that the reactor is properly adjusted. A maladjusted reactor can drive the pH down even lower than usual and, in that case, proper adjustment is the first step. How to set a reactor's various parameters is beyond the scope of this article, but from this standpoint, the effluent's pH or alkalinity must not be too low. Many approaches have been suggested, with varying success, to minimize the low pH problem encountered with CaCO3/CO2 reactors. One is to use a two-stage reactor that passes the fluid through a second chamber of CaCO3 before releasing it into the tank. Dissolving additional CaCO3 raises the pH, and also raises both the calcium and alkalinity levels in the effluent. This approach seems to successfully raise the effluent's pH, but it cannot raise it all the way to the tank's pH, so the low pH problem may not completely disappear. Another approach is to aerate the effluent before it is delivered to the tank. In this case, the goal is to blow off the excess CO2 before it gets to the tank. This approach can work in theory, but typically does not in practice because not enough degassing time is permitted before the effluent enters the tank. Another concern with this approach is that if it really could raise the effluent's pH, the supersaturation of CaCO3 in the effluent might rise high enough to reprecipitate CaCO3 in the reactor, fouling it and reducing its effectiveness. A final approach, and probably the most successful, is to combine the CaCO3/CO2 reactor with another alkalinity supplementation scheme that raises pH. The most useful method for this is limewater. In this situation, the limewater is not used to provide large amounts of calcium or alkalinity, but to soak up some of the excess CO2, and thereby raise the pH. The amount of limewater needed is not as large as for full maintenance of calcium and alkalinity. The limewater addition can also be put on a timer to add it only at night and early morning, when the daily pH lows are most likely to be problematic. The limewater addition could also be put on a pH controller, so that it is added only when the pH gets unusually low (such as below pH 7.8 or so). High indoor carbon dioxide levels can also lead to low pH problems in many reef aquaria. Respiration by people and pets, the use of un-vented appliances burning natural gas (e.g., ovens and stoves) and the use of CaCO3/CO2 reactors can raise indoor carbon dioxide levels. The carbon dioxide level can easily be more than twice that of exterior air, and this excess can substantially lower the aquarium’s pH. This problem is especially severe in newer, more airtight homes. It is unlikely to be a problem in homes such as mine, where the wind can be felt blowing around old window frames. Many aquarists have found that opening a window near the aquarium can significantly raise the pH within a day or two. Unfortunately, aquarists living in hot or cold climates cannot comfortably open windows year-round. Some have found it useful in these situations to run a pipe or tubing from the outside to a skimmer's air input, where fresh exterior air is rapidly mixed with the aquarium water. Be advised, though, that if you happen to live in an area where insecticides are periodically sprayed for mosquito control (such as in many metropolitan areas of the South), it may be important to place some type of carbon filter at the air intake to prevent these chemicals from entering the aquarium. The results obtained with such an air intake vary. It helps some aquaria, and not others. The problem is that the tank's top and other surfaces are still potentially exposed to the high CO2 indoor air. Finally, the use of limewater can be an appropriate solution. Limewater may be especially effective in these situations because the tank is less likely than a tank whose pH is normal to experience the undesirably high pH that sometimes accompanies limewater use. While limewater is the aquarium supplement most potent at raising pH, other high pH additives may also suffice, such as some of the high pH two-part calcium and alkalinity additive systems. Low alkalinity can also lead to low pH. For example, if alkalinity is not supplemented as fast as it is removed by calcification, the pH will likely drop. This drop will occur with all alkalinity supplementation schemes, but will be most observable when using schemes that do not themselves raise pH (such as CaCO3/CO2 reactors or additives using unbaked baking soda). In this situation, the obvious solution is to somehow add more alkalinity. The higher the combined respiration of the aquarium, the larger the diurnal swings will be as alkalinity falls. The pH of marine aquaria is an important parameter with which most aquarists are familiar. It has important effects on the health and well-being of our systems' inhabitants, and we owe it to them to do the best we can to keep it in an acceptable range. Measuring pH is not complicated, and generally need not be expensive. Even inexpensive pH meters can be a good choice if properly selected and used. Test kits can also be effective, but run the risk of being inaccurate without easy ways to verify their accuracy (aside from testing them against a pH meter). In many reef aquaria, aquarists find that the pH is naturally in a range that they are comfortable with (say, 8.0 to 8.5), and they may need to do nothing to actively “control” pH. However, some aquarists do find pH to be too high (usually only when using limewater) or too low (most often from too much carbon dioxide in their home's air). The best pH control methods are generally inexpensive, although some of the best options may be limited for aquarists in climates where bringing in a lot of fresh (outside) air is problematic. Nevertheless, there are useful ways to control pH (aeration and using limewater), and there are others that almost always have limited success or undesirable consequences (such as excessive alkalinity when using buffers). Hopefully, this article has provided the information necessary for aquarists to control pH in their aquaria in appropriate and effective ways that avoid these undesirable consequences.